EDI files contain large amount of container data and this needs to be imported into application databases. Bulk import of data should be done as a background process for efficient performance. Concurrency means that two or more tasks are making progress even though they might not be executing simultaneously. This can for example be realized with time slicing where parts of tasks are executed sequentially and mixed with parts of other tasks. Parallelism on the other hand means, execution is truly simultaneous. Blocking: if the delay in one thread can indefeinitely delay some of the other threads. A good example is a resource which can be used exclusively by one thread using mutual exclusion. If a thread holds on to the resource for long time (for example waiting for data from external system) other threads waiting on the resource can not progress. IO Operations performed are blocking process. In contrast, non-blocking means that no thread is able to indefinitely delay others. Since Java 5 – Thread Pools, Future and Promise provide a good handle for performing tasks asynchronously, multi core CPU can be utilised to do the tasks in parallel. Use a simple Worker thread model, create a bunch of threads and have master thread to assign different containers to process it. Currently this model is used in N4 EDI Upload process. Introduced as part of Stream API in Lamda Architecture. Parallel streams create a number of CPU core + 1 threads and process the data asynchronously. This can be applied on any Java Collection Stream API (for ex: for). Uses fork/join framework. Part of the spring.io family, provides a lightweight batch framework. Has the option to schedule a job. Ideal for managing huge volume of Jobs to be processed in different nodes, takes care of scheduling the job, maintaining who executes it and ensures job is executed by a node in the cluster. Uses fork/join thread framework for effectively processing the messages. 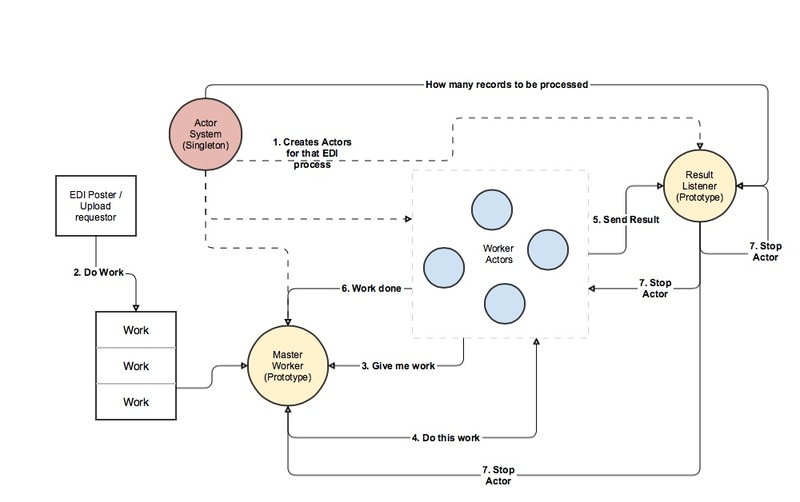 Works based on message queues(which takes the data for processing), Actors (who performs the task with the help of workers). Akka has a well defined thread scheduling algorithm which helps to compute the data faster and achieve maximum concurrency. No thread level programming, all the programming stuff includes messages and actors. These are boilerplate code to build the system. Business logic will not have any Akka implementation details. Let us consider a solution using the Akka framework for EDI import processing. Simple and high-level abstractions for concurrency and parallelism. Asynchronous, non-blocking and high performance event-driven programming model. Very lightweight event-driven processes (several million actors per GB of heap memory). Supervisor hierarchies with “let-it-crash” semantics. 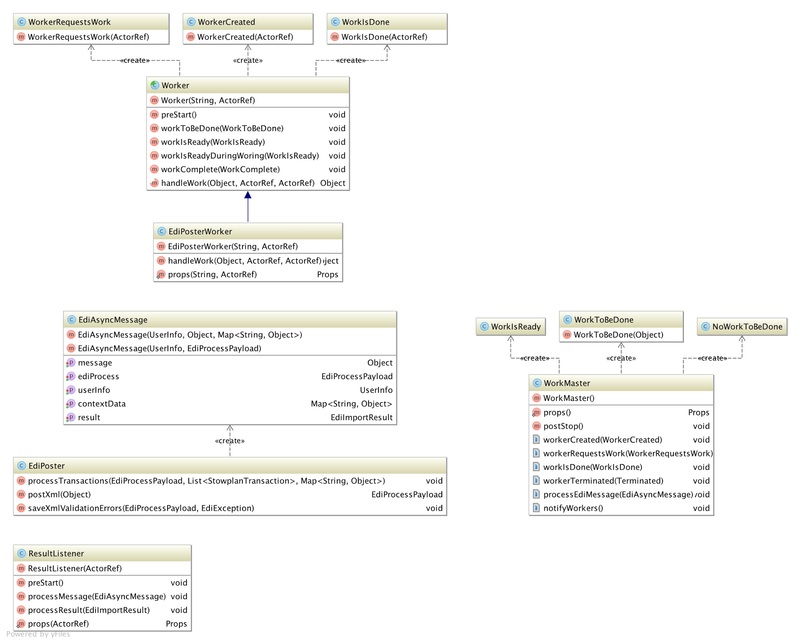 Supervisor hierarchies can span over multiple JVMs to provide truly fault-tolerant systems. Excellent for writing highly fault-tolerant systems that self-heal and never stop. Result listener – gets the processed message(success, failures, warnings) from workers, maintains the list of number of messages to be processed and how many are processed. Updates the process and error table on a regular basis. Once all the messages are processed responsible for sending stop messages to actors part of that edi process. To be able to use the Spring application context to let Spring create and wire up actors, we need to store it away in a place that is easily accessible from within the actor system. Akka extension helps to achieve the same. The extension consist of two parts. The SpringExtension class that defines the methods used by Akka to create the extension for an actor system, and the SpringExt class that defines the methods and fields available on the extension.